Not to be confused with Quantum field theory. Solution to Schrödinger's equation for the hydrogen atom at different energy levels. The brighter areas represent a higher probability of finding an electron. Quantum mechanics (QM; also known as quantum physics or quantum theory), including quantum field theory, is a fundamental branch of physics concerned with processes involving, for example, atoms and photons. Systems such as these which obey quantum mechanics can be in a quantum superposition of different states, unlike in classical physics. Important applications of quantum theory include superconducting magnets, light-emitting diodes, and the laser, the transistor and semiconductors such as the microprocessor, medical and research imaging such as magnetic resonance imaging and electron microscopy, and explanations for many biological and physical phenomena. Following Max Planck's solution in 1900 to the black-body radiation problem (reported 1859), Albert Einstein offered a quantum-based theory to explain the photoelectric effect (1905, reported 1887). Around 1900-1910, the atomic theory and the corpuscular theory of light first came to be widely accepted as scientific fact; these latter theories can be viewed as quantum theories of matter and electromagnetic radiation, respectively. 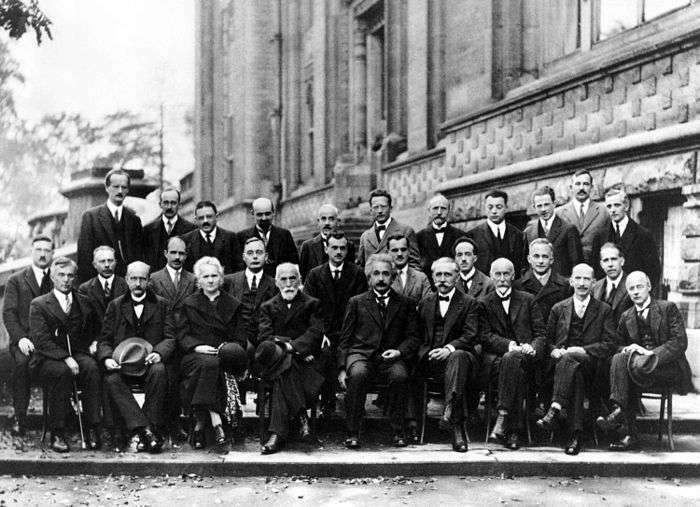 The 1927 Solvay Conference in Brussels. In the mid-1920s, developments in quantum mechanics led to its becoming the standard formulation for atomic physics. In the summer of 1925, Bohr and Heisenberg published results that closed the old quantum theory. Out of deference to their particle-like behavior in certain processes and measurements, light quanta came to be called photons (1926). From Einstein's simple postulation was born a flurry of debating, theorizing, and testing. Thus, the entire field of quantum physics emerged, leading to its wider acceptance at the Fifth Solvay Conference in 1927. 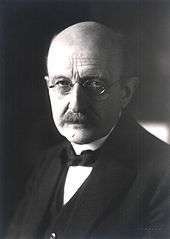 By 1930, quantum mechanics had been further unified and formalized by the work of David Hilbert, Paul Dirac and John von Neumann with greater emphasis on measurement, the statistical nature of our knowledge of reality, and philosophical speculation about the 'observer'. It has since permeated many disciplines including quantum chemistry, quantum electronics, quantum optics, and quantum information science. Its speculative modern developments include string theory and quantum gravity theories. It also provides a useful framework for many features of the modern periodic table of elements, and describes the behaviors of atoms during chemical bonding and the flow of electrons in computer semiconductors, and therefore plays a crucial role in many modern technologies. The word quantum derives from the Latin, meaning "how great" or "how much". In quantum mechanics, it refers to a discrete unit assigned to certain physical quantities such as the energy of an atom at rest (see Figure 1). The discovery that particles are discrete packets of energy with wave-like properties led to the branch of physics dealing with atomic and subatomic systems which is today called quantum mechanics. It underlies the mathematical framework of many fields of physics and chemistry, including condensed matter physics, solid-state physics, atomic physics, molecular physics, computational physics, computational chemistry, quantum chemistry, particle physics, nuclear chemistry, and nuclear physics. Some fundamental aspects of the theory are still actively studied. Quantum mechanics is essential to understanding the behavior of systems at atomic length scales and smaller. If the physical nature of an atom were solely described by classical mechanics, electrons would not orbit the nucleus, since orbiting electrons emit radiation (due to circular motion) and would eventually collide with the nucleus due to this loss of energy. This framework was unable to explain the stability of atoms. Instead, electrons remain in an uncertain, non-deterministic, smeared, probabilistic wave–particle orbital about the nucleus, defying the traditional assumptions of classical mechanics and electromagnetism. In the mathematically rigorous formulation of quantum mechanics developed by Paul Dirac, David Hilbert, John von Neumann, and Hermann Weyl, the possible states of a quantum mechanical system are symbolized as unit vectors (called state vectors). Formally, these reside in a complex separable Hilbert space—variously called the state space or the associated Hilbert space of the system—that is well defined up to a complex number of norm 1 (the phase factor). In other words, the possible states are points in the projective space of a Hilbert space, usually called the complex projective space. The exact nature of this Hilbert space is dependent on the system—for example, the state space for position and momentum states is the space of square-integrable functions, while the state space for the spin of a single proton is just the product of two complex planes. Each observable is represented by a maximally Hermitian (precisely: by a self-adjoint) linear operator acting on the state space. Each eigenstate of an observable corresponds to an eigenvector of the operator, and the associated eigenvalue corresponds to the value of the observable in that eigenstate. If the operator's spectrum is discrete, the observable can attain only those discrete eigenvalues. In the formalism of quantum mechanics, the state of a system at a given time is described by a complex wave function, also referred to as state vector in a complex vector space. This abstract mathematical object allows for the calculation of probabilities of outcomes of concrete experiments. For example, it allows one to compute the probability of finding an electron in a particular region around the nucleus at a particular time. Contrary to classical mechanics, one can never make simultaneous predictions of conjugate variables, such as position and momentum, to arbitrary precision. For instance, electrons may be considered (to a certain probability) to be located somewhere within a given region of space, but with their exact positions unknown. Contours of constant probability, often referred to as "clouds", may be drawn around the nucleus of an atom to conceptualize where the electron might be located with the most probability. Heisenberg's uncertainty principle quantifies the inability to precisely locate the particle given its conjugate momentum. According to one interpretation, as the result of a measurement the wave function containing the probability information for a system collapses from a given initial state to a particular eigenstate. The possible results of a measurement are the eigenvalues of the operator representing the observable—which explains the choice of Hermitian operators, for which all the eigenvalues are real. The probability distribution of an observable in a given state can be found by computing the spectral decomposition of the corresponding operator. Heisenberg's uncertainty principle is represented by the statement that the operators corresponding to certain observables do not commute. In the everyday world, it is natural and intuitive to think of everything (every observable) as being in an eigenstate. Everything appears to have a definite position, a definite momentum, a definite energy, and a definite time of occurrence. However, quantum mechanics does not pinpoint the exact values of a particle's position and momentum (since they are conjugate pairs) or its energy and time (since they too are conjugate pairs); rather, it provides only a range of probabilities in which that particle might be given its momentum and momentum probability. Therefore, it is helpful to use different words to describe states having uncertain values and states having definite values (eigenstates). Usually, a system will not be in an eigenstate of the observable (particle) we are interested in. However, if one measures the observable, the wave function will instantaneously be an eigenstate (or "generalized" eigenstate) of that observable. This process is known as wave function collapse, a controversial and much-debated process that involves expanding the system under study to include the measurement device. If one knows the corresponding wave function at the instant before the measurement, one will be able to compute the probability of the wave function collapsing into each of the possible eigenstates. For example, the free particle in the previous example will usually have a wave function that is a wave packet centered around some mean position x0 (neither an eigenstate of position nor of momentum). When one measures the position of the particle, it is impossible to predict with certainty the result. It is probable, but not certain, that it will be near x0, where the amplitude of the wave function is large. After the measurement is performed, having obtained some result x, the wave function collapses into a position eigenstate centered at x. The time evolution of a quantum state is described by the Schrödinger equation, in which the Hamiltonian (the operator corresponding to the total energy of the system) generates the time evolution. The time evolution of wave functions is deterministic in the sense that - given a wave function at an initial time - it makes a definite prediction of what the wave function will be at any later time. Some wave functions produce probability distributions that are constant, or independent of time—such as when in a stationary state of constant energy, time vanishes in the absolute square of the wave function. Many systems that are treated dynamically in classical mechanics are described by such "static" wave functions. For example, a single electron in an unexcited atom is pictured classically as a particle moving in a circular trajectory around the atomic nucleus, whereas in quantum mechanics it is described by a static, spherically symmetric wave function surrounding the nucleus (Fig. 1) (note, however, that only the lowest angular momentum states, labeled s, are spherically symmetric). The Schrödinger equation acts on the entire probability amplitude, not merely its absolute value. Whereas the absolute value of the probability amplitude encodes information about probabilities, its phase encodes information about the interference between quantum states. This gives rise to the "wave-like" behavior of quantum states. As it turns out, analytic solutions of the Schrödinger equation are available for only a very small number of relatively simple model Hamiltonians, of which the quantum harmonic oscillator, the particle in a box, the dihydrogen cation, and the hydrogen atom are the most important representatives. Even the helium atom—which contains just one more electron than does the hydrogen atom—has defied all attempts at a fully analytic treatment. There are numerous mathematically equivalent formulations of quantum mechanics. One of the oldest and most commonly used formulations is the "transformation theory" proposed by Paul Dirac, which unifies and generalizes the two earliest formulations of quantum mechanics - matrix mechanics (invented by Werner Heisenberg) and wave mechanics (invented by Erwin Schrödinger). The rules of quantum mechanics are fundamental. They assert that the state space of a system is a Hilbert space and that observables of that system are Hermitian operators acting on that space—although they do not tell us which Hilbert space or which operators. These can be chosen appropriately in order to obtain a quantitative description of a quantum system. An important guide for making these choices is the correspondence principle, which states that the predictions of quantum mechanics reduce to those of classical mechanics when a system moves to higher energies or, equivalently, larger quantum numbers, i.e. whereas a single particle exhibits a degree of randomness, in systems incorporating millions of particles averaging takes over and, at the high energy limit, the statistical probability of random behaviour approaches zero. In other words, classical mechanics is simply a quantum mechanics of large systems. 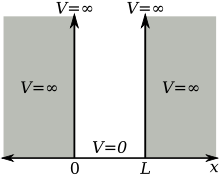 This "high energy" limit is known as the classical or correspondence limit. One can even start from an established classical model of a particular system, then attempt to guess the underlying quantum model that would give rise to the classical model in the correspondence limit. Early attempts to merge quantum mechanics with special relativity involved the replacement of the Schrödinger equation with a covariant equation such as the Klein–Gordon equation or the Dirac equation. While these theories were successful in explaining many experimental results, they had certain unsatisfactory qualities stemming from their neglect of the relativistic creation and annihilation of particles. A fully relativistic quantum theory required the development of quantum field theory, which applies quantization to a field (rather than a fixed set of particles). The first complete quantum field theory, quantum electrodynamics, provides a fully quantum description of the electromagnetic interaction. The full apparatus of quantum field theory is often unnecessary for describing electrodynamic systems. A simpler approach, one that has been employed since the inception of quantum mechanics, is to treat charged particles as quantum mechanical objects being acted on by a classical electromagnetic field. For example, the elementary quantum model of the hydrogen atom describes the electric field of the hydrogen atom using a classical Coulomb potential. This "semi-classical" approach fails if quantum fluctuations in the electromagnetic field play an important role, such as in the emission of photons by charged particles. Gravity is negligible in many areas of particle physics, so that unification between general relativity and quantum mechanics is not an urgent issue in those particular applications. However, the lack of a correct theory of quantum gravity is an important issue in cosmology and the search by physicists for an elegant "Theory of Everything" (TOE). Consequently, resolving the inconsistencies between both theories has been a major goal of 20th and 21st century physics. Many prominent physicists, including Stephen Hawking, have labored for many years in the attempt to discover a theory underlying everything. This TOE would combine not only the different models of subatomic physics, but also derive the four fundamental forces of nature - the strong force, electromagnetism, the weak force, and gravity - from a single force or phenomenon. While Stephen Hawking was initially a believer in the Theory of Everything, after considering Gödel's Incompleteness Theorem, he has concluded that one is not obtainable, and has stated so publicly in his lecture "Gödel and the End of Physics" (2002). The quest to unify the fundamental forces through quantum mechanics is still ongoing. Quantum electrodynamics (or "quantum electromagnetism"), which is currently (in the perturbative regime at least) the most accurately tested physical theory in competition with general relativity, has been successfully merged with the weak nuclear force into the electroweak force and work is currently being done to merge the electroweak and strong force into the electrostrong force. Current predictions state that at around 1014 GeV the three aforementioned forces are fused into a single unified field. Beyond this "grand unification", it is speculated that it may be possible to merge gravity with the other three gauge symmetries, expected to occur at roughly 1019 GeV. However — and while special relativity is parsimoniously incorporated into quantum electrodynamics — the expanded general relativity, currently the best theory describing the gravitation force, has not been fully incorporated into quantum theory. One of those searching for a coherent TOE is Edward Witten, a theoretical physicist who formulated the M-theory, which is an attempt at describing the supersymmetrical based string theory. M-theory posits that our apparent 4-dimensional spacetime is, in reality, actually an 11-dimensional spacetime containing 10 spatial dimensions and 1 time dimension, although 7 of the spatial dimensions are - at lower energies - completely "compactified" (or infinitely curved) and not readily amenable to measurement or probing. The Copenhagen interpretation — due largely to Niels Bohr and Werner Heisenberg — remains most widely accepted amongst physicists, some 75 years after its enunciation. According to this interpretation, the probabilistic nature of quantum mechanics is not a temporary feature which will eventually be replaced by a deterministic theory, but instead must be considered a final renunciation of the classical idea of "causality." It is also believed therein that any well-defined application of the quantum mechanical formalism must always make reference to the experimental arrangement, due to the conjugate nature of evidence obtained under different experimental situations. John Bell showed that this "EPR" paradox led to experimentally testable differences between quantum mechanics and theories that rely on added hidden variables. Experiments have been performed confirming the accuracy of quantum mechanics, thereby demonstrating that quantum mechanics cannot be improved upon by addition of hidden variables. Alain Aspect's initial experiments in 1982, and many subsequent experiments since, have definitively verified quantum entanglement. The Everett many-worlds interpretation, formulated in 1956, holds that all the possibilities described by quantum theory simultaneously occur in a multiverse composed of mostly independent parallel universes. This is not accomplished by introducing some "new axiom" to quantum mechanics, but on the contrary, by removing the axiom of the collapse of the wave packet. All of the possible consistent states of the measured system and the measuring apparatus (including the observer) are present in a real physical - not just formally mathematical, as in other interpretations - quantum superposition. Such a superposition of consistent state combinations of different systems is called an entangled state. While the multiverse is deterministic, we perceive non-deterministic behavior governed by probabilities, because we can only observe the universe (i.e., the consistent state contribution to the aforementioned superposition) that we, as observers, inhabit. Everett's interpretation is perfectly consistent with John Bell's experiments and makes them intuitively understandable. However, according to the theory of quantum decoherence, these "parallel universes" will never be accessible to us. The inaccessibility can be understood as follows: once a measurement is done, the measured system becomes entangled with both the physicist who measured it and a huge number of other particles, some of which are photons flying away at the speed of light towards the other end of the universe. In order to prove that the wave function did not collapse, one would have to bring all these particles back and measure them again, together with the system that was originally measured. Not only is this completely impractical, but even if one could theoretically do this, it would have to destroy any evidence that the original measurement took place (including the physicist's memory). In light of these Bell tests, Cramer (1986) formulated his transactional interpretation. Relational quantum mechanics appeared in the late 1990s as the modern derivative of the Copenhagen Interpretation. Quantum mechanics has had enormous success in explaining many of the features of our universe. Quantum mechanics is often the only tool available that can reveal the individual behaviors of the subatomic particles that make up all forms of matter (electrons, protons, neutrons, photons, and others). Quantum mechanics has strongly influenced string theories, candidates for a Theory of Everything (see reductionism). Quantum mechanics is also critically important for understanding how individual atoms combine covalently to form molecules. The application of quantum mechanics to chemistry is known as quantum chemistry. Relativistic quantum mechanics can, in principle, mathematically describe most of chemistry. Quantum mechanics can also provide quantitative insight into ionic and covalent bonding processes by explicitly showing which molecules are energetically favorable to which others and the magnitudes of the energies involved. Furthermore, most of the calculations performed in modern computational chemistry rely on quantum mechanics. Many modern electronic devices are designed using quantum mechanics. Examples include the laser, the transistor (and thus the microchip), the electron microscope, and magnetic resonance imaging (MRI). The study of semiconductors led to the invention of the diode and the transistor, which are indispensable parts of modern electronics systems, computer and telecommunication devices. Another application is the light emitting diode which is a high-efficiency source of light. Many electronic devices operate under effect of Quantum tunneling. It even exists in the simple light switch. The switch would not work if electrons could not quantum tunnel through the layer of oxidation on the metal contact surfaces. Flash memory chips found in USB drives use quantum tunneling to erase their memory cells. Some negative differential resistance devices also utilizes quantum tunneling effect, such as resonant tunneling diode. Unlike classical diodes, its current is carried by resonant tunneling through two potential barriers (see right figure). Its negative resistance behavior can only be understood with quantum mechanics: As the confined state moves close to Fermi level, tunnel current increases. As it moves away, current decreases. Quantum mechanics is vital to understanding and designing such electronic devices. A more distant goal is the development of quantum computers, which are expected to perform certain computational tasks exponentially faster than classical computers. Instead of using classical bits, quantum computers use qubits, which can be in superpositions of states. Another active research topic is quantum teleportation, which deals with techniques to transmit quantum information over arbitrary distances. For example, consider a free particle. In quantum mechanics, there is wave–particle duality, so the properties of the particle can be described as the properties of a wave. Therefore, its quantum state can be represented as a wave of arbitrary shape and extending over space as a wave function. The position and momentum of the particle are observables. The Uncertainty Principle states that both the position and the momentum cannot simultaneously be measured with complete precision. However, one can measure the position (alone) of a moving free particle, creating an eigenstate of position with a wave function that is very large (a Dirac delta) at a particular position x, and zero everywhere else. If one performs a position measurement on such a wave function, the resultant x will be obtained with 100% probability (i.e., with full certainty, or complete precision). This is called an eigenstate of position—or, stated in mathematical terms, a generalized position eigenstate (eigendistribution). If the particle is in an eigenstate of position, then its momentum is completely unknown. On the other hand, if the particle is in an eigenstate of momentum, then its position is completely unknown. 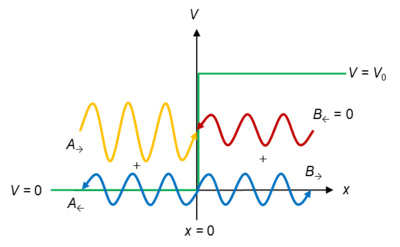 In an eigenstate of momentum having a plane wave form, it can be shown that the wavelength is equal to h/p, where h is Planck's constant and p is the momentum of the eigenstate. with coefficients A and B determined from the boundary conditions and by imposing a continuous derivative on the solution. with state in this case having energy coincident with the kinetic energy of the particle. Some trajectories of a harmonic oscillator (i.e. a ball attached to a spring) in classical mechanics (A-B) and quantum mechanics (C-H). In quantum mechanics, the position of the ball is represented by a wave (called the wave function), with the real part shown in blue and the imaginary part shown in red. Some of the trajectories (such as C,D,E,and F) are standing waves (or "stationary states"). Each standing-wave frequency is proportional to a possible energy level of the oscillator. This "energy quantization" does not occur in classical physics, where the oscillator can have any energy. ↑ Kuhn, T. S. (1978). Black-body theory and the quantum discontinuity 1894-1912. Oxford: Clarendon Press. ISBN 0195023838. ↑ Einstein, A. (1905). "Über einen die Erzeugung und Verwandlung des Lichtes betreffenden heuristischen Gesichtspunkt" [On a heuristic point of view concerning the production and transformation of light]. Annalen der Physik. 17 (6): 132–148. Bibcode:1905AnP...322..132E. doi:10.1002/andp.19053220607. Reprinted in The collected papers of Albert Einstein, John Stachel, editor, Princeton University Press, 1989, Vol. 2, pp. 149-166, in German; see also Einstein's early work on the quantum hypothesis, ibid. pp. 134-148. ↑ van Hove, Leon (1958). "Von Neumann's contributions to quantum mechanics" (PDF). Bulletin of the American Mathematical Society. 64 (3): Part2:95–99. doi:10.1090/s0002-9904-1958-10206-2. ↑ Feynman, Richard. "The Feynman Lectures on Physics III 21-4". California Institute of Technology. Retrieved 2015-11-24. "...it was long believed that the wave function of the Schrödinger equation would never have a macroscopic representation analogous to the macroscopic representation of the amplitude for photons. On the other hand, it is now realized that the phenomena of superconductivity presents us with just this situation. ↑ "Quantum - Definition and More from the Free Merriam-Webster Dictionary". Merriam-webster.com. Retrieved 2012-08-18. ↑ Thall, Edwin. "Thall's History of Quantum Mechanics". Florida Community College at Jacksonville. Archived from the original on October 7, 2009. Retrieved May 23, 2009. ↑ "ysfine.com". ysfine.com. Retrieved 11 September 2015. ↑ "QUANTUM MECHANICS". geocities.com. 2009-10-26. Archived from the original on 2009-10-26. Retrieved 2016-06-13. ↑ H.Weyl "The Theory of Groups and Quantum Mechanics", 1931 (original title: "Gruppentheorie und Quantenmechanik"). ↑ Dirac, P.A.M. (1958). The Principles of Quantum Mechanics, 4th edition, Oxford University Press, Oxford UK, p. ix: "For this reason I have chosen the symbolic method, introducing the representatives later merely as an aid to practical calculation." ↑ "Heisenberg - Quantum Mechanics, 1925–1927: The Uncertainty Relations". Aip.org. Retrieved 2012-08-18. ↑ "[Abstract] Visualization of Uncertain Particle Movement". Actapress.com. Retrieved 2012-08-18. ↑ Hirshleifer, Jack (2001). The Dark Side of the Force: Economic Foundations of Conflict Theory. Campbridge University Press. p. 265. ISBN 0-521-80412-4. , Chapter , p.
↑ "dict.cc dictionary :: eigen :: German-English translation". dict.cc. Retrieved 11 September 2015. ↑ "Topics: Wave-Function Collapse". Phy.olemiss.edu. 2012-07-27. Retrieved 2012-08-18. ↑ "Collapse of the wave-function". Farside.ph.utexas.edu. Retrieved 2012-08-18. ↑ "Determinism and Naive Realism : philosophy". Reddit.com. 2009-06-01. Retrieved 2012-08-18. ↑ Michael Trott. "Time-Evolution of a Wavepacket in a Square Well — Wolfram Demonstrations Project". Demonstrations.wolfram.com. Retrieved 2010-10-15. ↑ Michael Trott. "Time Evolution of a Wavepacket In a Square Well". Demonstrations.wolfram.com. Retrieved 2010-10-15. ↑ "Wave Functions and the Schrödinger Equation" (PDF). Retrieved 2010-10-15. ↑ Rechenberg, Helmut (1987). "Erwin Schrödinger and the creation of wave mechanics" (PDF). Acta Physica Polonica B. 19 (8): 683–695. Retrieved 13 June 2016. ↑ Nancy Thorndike Greenspan, "The End of the Certain World: The Life and Science of Max Born" (Basic Books, 2005), pp. 124-8 and 285-6. ↑ "The Nobel Prize in Physics 1979". Nobel Foundation. Retrieved 2010-02-16. ↑ Carl M. Bender; Daniel W. Hook; Karta Kooner (2009-12-31). "Complex Elliptic Pendulum". arXiv:1001.0131 [hep-th]. ↑ See, for example, Precision tests of QED. The relativistic refinement of quantum mechanics known as quantum electrodynamics (QED) has been shown to agree with experiment to within 1 part in 108 for some atomic properties. ↑ Tipler, Paul; Llewellyn, Ralph (2008). Modern Physics (5 ed.). W. H. Freeman and Company. pp. 160–161. ISBN 978-0-7167-7550-8. ↑ "Quantum mechanics course iwhatisquantummechanics". Scribd.com. 2008-09-14. Retrieved 2012-08-18. ↑ A. Einstein, B. Podolsky, and N. Rosen, Can quantum-mechanical description of physical reality be considered complete? Phys. Rev. 47 777 (1935). ↑ N. P. Landsman (June 13, 2005). "Between classical and quantum" (PDF). Retrieved 2012-08-19. Handbook of the Philosophy of Science Vol. 2: Philosophy of Physics (eds. John Earman & Jeremy Butterfield). ↑ "Atomic Properties". Academic.brooklyn.cuny.edu. Retrieved 2012-08-18. ↑ Born, M., Heisenberg, W., Jordan, P. (1926). Z. Phys. 35: 557–615. Translated as 'On quantum mechanics II', pp. 321–385 in Van der Waerden, B.L. (1967), Sources of Quantum Mechanics, North-Holland, Amsterdam, "The basic difference between the theory proposed here and that used hitherto ... lies in the characteristic kinematics ...", p. 385. ↑ Dirac, P.A.M. (1930/1958). The Principles of Quantum Mechanics, fourth edition, Oxford University Press, Oxford UK, p. 5: "A question about what will happen to a particular photon under certain conditions is not really very precise. To make it precise one must imagine some experiment performed having a bearing on the question, and enquire what will be the result of the experiment. Only questions about the results of experiments have a real significance and it is only such questions that theoretical physics has to consider." ↑ Bohr, N. (1939). The Causality Problem in Atomic Physics, in New Theories in Physics, Conference organized in collaboration with the International Union of Physics and the Polish Intellectual Co-operation Committee, Warsaw, May 30th – June 3rd 1938, International Institute of Intellectual Co-operation, Paris, 1939, pp. 11–30, reprinted in Niels Bohr, Collected Works, volume 7 (1933 – 1958) edited by J. Kalckar, Elsevier, Amsterdam, ISBN 0-444-89892-1, pp. 303–322. "The essential lesson of the analysis of measurements in quantum theory is thus the emphasis on the necessity, in the account of the phenomena, of taking the whole experimental arrangement into consideration, in complete conformity with the fact that all unambiguous interpretation of the quantum mechanical formalism involves the fixation of the external conditions, defining the initial state of the atomic system and the character of the possible predictions as regards subsequent observable properties of that system. Any measurement in quantum theory can in fact only refer either to a fixation of the initial state or to the test of such predictions, and it is first the combination of both kinds which constitutes a well-defined phenomenon." ↑ Bohr, N. (1948). On the notions of complementarity and causality, Dialectica 2: 312–319. "As a more appropriate way of expression, one may advocate limitation of the use of the word phenomenon to refer to observations obtained under specified circumstances, including an account of the whole experiment." ↑ Ludwig, G. (1987). An Axiomatic Basis for Quantum Mechanics, volume 2, Quantum Mechanics and Macrosystems, translated by K. Just, Springer, Berlin, ISBN 978-3-642-71899-1, Chapter XIII, Special Structures in Preparation and Registration Devices, §1, Measurement chains, p. 132. 1 2 Heisenberg, W. (1927). Über den anschaulichen Inhalt der quantentheoretischen Kinematik und Mechanik, Z. Phys. 43: 172–198. Translation as 'The actual content of quantum theoretical kinematics and mechanics' here , "But in the rigorous formulation of the law of causality, — "If we know the present precisely, we can calculate the future" — it is not the conclusion that is faulty, but the premise." ↑ Green, H.S. (1965). Matrix Mechanics, with a foreword by Max Born, P. Noordhoff Ltd, Groningen. "It is not possible, therefore, to provide 'initial conditions' for the prediction of the behaviour of atomic systems, in the way contemplated by classical physics. This is accepted by quantum theory, not merely as an experimental difficulty, but as a fundamental law of nature", p. 32. ↑ Rosenfeld, L. (1957). Misunderstandings about the foundations of quantum theory, pp. 41–45 in Observation and Interpretation, edited by S. Körner, Butterworths, London. "A phenomenon is therefore a process (endowed with the characteristic quantal wholeness) involving a definite type of interaction between the system and the apparatus." ↑ Dirac, P.A.M. (1973). Development of the physicist's conception of nature, pp. 1–55 in The Physicist's Conception of Nature, edited by J. Mehra, D. Reidel, Dordrecht, ISBN 90-277-0345-0, p. 5: "That led Heisenberg to his really masterful step forward, resulting in the new quantum mechanics. His idea was to build up a theory entirely in terms of quantities referring to two states." ↑ Born, M. (1927). Physical aspects of quantum mechanics, Nature 119: 354–357, "These probabilities are thus dynamically determined. But what the system actually does is not determined ..."
↑ Messiah, A. (1961). Quantum Mechanics, volume 1, translated by G.M. Temmer from the French Mécanique Quantique, North-Holland, Amsterdam, p. 157. ↑ Bohr, N. (1928). The Quantum postulate and the recent development of atomic theory, Nature 121: 580–590. ↑ Heisenberg, W. (1930). The Physical Principles of the Quantum Theory, translated by C. Eckart and F.C. Hoyt, University of Chicago Press. ↑ Goldstein, H. (1950). Classical Mechanics, Addison-Wesley, ISBN 0-201-02510-8. ↑ "Stephen Hawking; Gödel and the end of physics". cam.ac.uk. Retrieved 11 September 2015. ↑ "The Nature of Space and Time". google.com. Retrieved 11 September 2015. ↑ Tatsumi Aoyama; Masashi Hayakawa; Toichiro Kinoshita; Makiko Nio (2012). "Tenth-Order QED Contribution to the Electron g-2 and an Improved Value of the Fine Structure Constant". Physical Review Letters. 109 (11): 111807. arXiv:1205.5368v2 . Bibcode:2012PhRvL.109k1807A. doi:10.1103/PhysRevLett.109.111807. ↑ Parker, B. (1993). Overcoming some of the problems. pp. 259–279. ↑ Weinberg, S. "Collapse of the State Vector", Phys. Rev. A 85, 062116 (2012). ↑ Harrison, Edward (16 March 2000). Cosmology: The Science of the Universe. Cambridge University Press. p. 239. ISBN 978-0-521-66148-5. ↑ "Action at a Distance in Quantum Mechanics (Stanford Encyclopedia of Philosophy)". Plato.stanford.edu. 2007-01-26. Retrieved 2012-08-18. ↑ "Everett's Relative-State Formulation of Quantum Mechanics (Stanford Encyclopedia of Philosophy)". Plato.stanford.edu. Retrieved 2012-08-18. ↑ See, for example, the Feynman Lectures on Physics for some of the technological applications which use quantum mechanics, e.g., transistors (vol III, pp. 14–11 ff), integrated circuits, which are follow-on technology in solid-state physics (vol II, pp. 8–6), and lasers (vol III, pp. 9–13). ↑ Pauling, Linus; Wilson, Edgar Bright (1985-03-01). Introduction to Quantum Mechanics with Applications to Chemistry. ISBN 9780486648712. Retrieved 2012-08-18. ↑ Chen, Xie; Gu, Zheng-Cheng; Wen, Xiao-Gang (2010). "Local unitary transformation, long-range quantum entanglement, wave function renormalization, and topological order". Phys. Rev. B. 82: 155138. arXiv:1004.3835 . Bibcode:2010PhRvB..82o5138C. doi:10.1103/physrevb.82.155138. ↑ Anderson, Mark (2009-01-13). "Is Quantum Mechanics Controlling Your Thoughts? | Subatomic Particles". DISCOVER Magazine. Retrieved 2012-08-18. ↑ "Quantum mechanics boosts photosynthesis". physicsworld.com. Retrieved 2010-10-23. ↑ Baofu, Peter (2007-12-31). The Future of Complexity: Conceiving a Better Way to Understand Order and Chaos. ISBN 9789812708991. Retrieved 2012-08-18.